Jerry Grillo and jazz piano virtuoso, Barry Velleman, have collaborated on a concert CD in the style of the Tony Bennett/Bill Evans albums which they both have treasured for many years. When presented in concert, the CD will have a brief narrative. It's jazz with a dash of cabaret. Mr. Velleman is playing the Steinway grand piano. WHAT'S IT ALL ABOUT? is a refreshing collection of standards sung by Jerry Grillo accompanied by Barry Velleman at the piano. 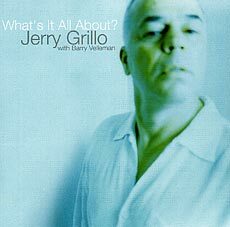 Jerry Grillo has a solid voice with the right jazz stylings, and he sings from the heart, each song an emotional bouquet to be shared with the listening audience. This collection has 14 songs. Among the songs are found Cole Porter's "What Is This Thing Called Love," "Alfie," "Learnin' The Blues," a fine rendition of Arthur Hamilton's "Cry Me A River," John Lennon's "Love," Cole Porter's "Night And Day," and "Have Yourself A Merry Little Christmas." A nice collection of songs sung with sensitivity by Jerry Grillo. The piano work of Barry Velleman is pure magic, filled with great solo work and stylings. Very enjoyable.